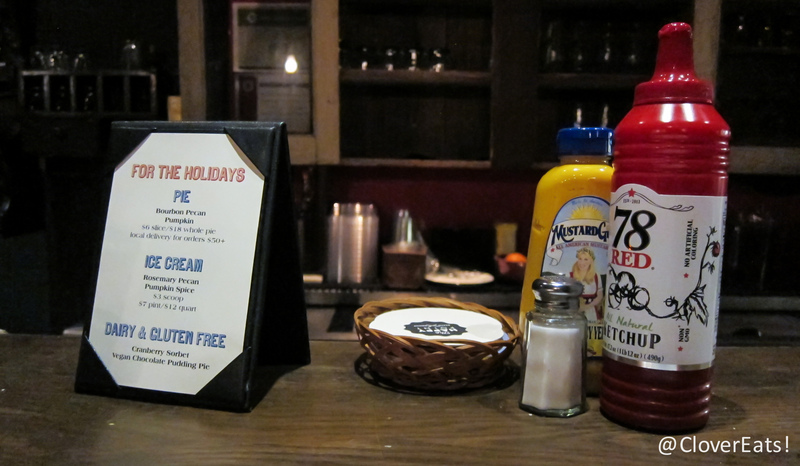 Adventures in the West Loop: bourbon milkshakes at Grange Hall Burger Bar | Clover Eats! It’s been a really chilly couple of days. However, it’s the holiday season, so I’m able to meet up with friends that I usually don’t get to see. 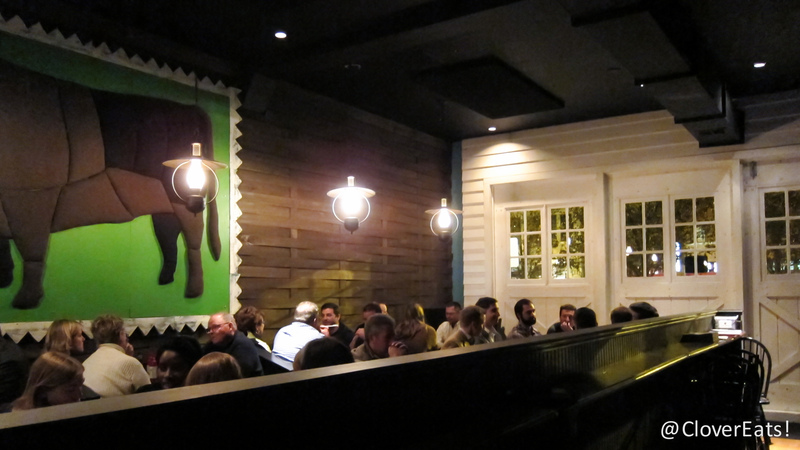 To celebrate, we originally tried to go to Au Cheval, but were told to expect at least a 3 hour (!!!) wait. So instead, we opted to trek all the way across Randolph in the cold, to the Asian Fusion restaurant bellyQ that is at the very end of the street. When we arrived, having passed many a tasty option on the way down there, we were greeted with a big closed sign. Apparently, both bellyQ and its little sibling restaurant Urbanbelly are closed Thanksgiving week. 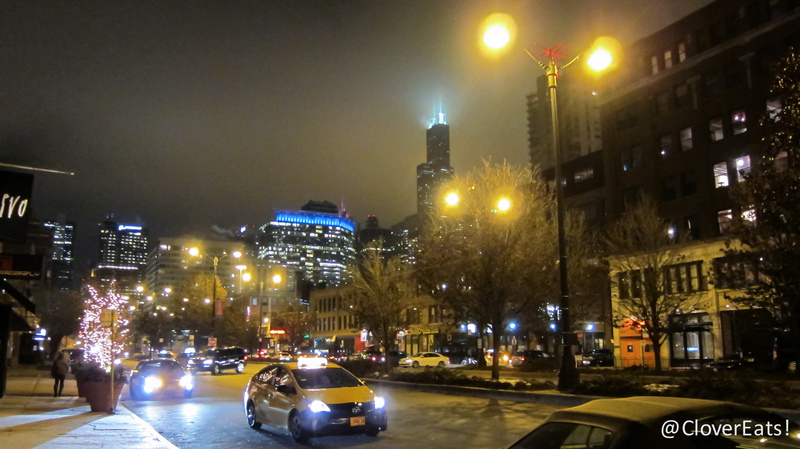 So we walked all the way back up Randolph, stopping in the occasional restaurant’s outdoor shelter to peruse menus and warm up. 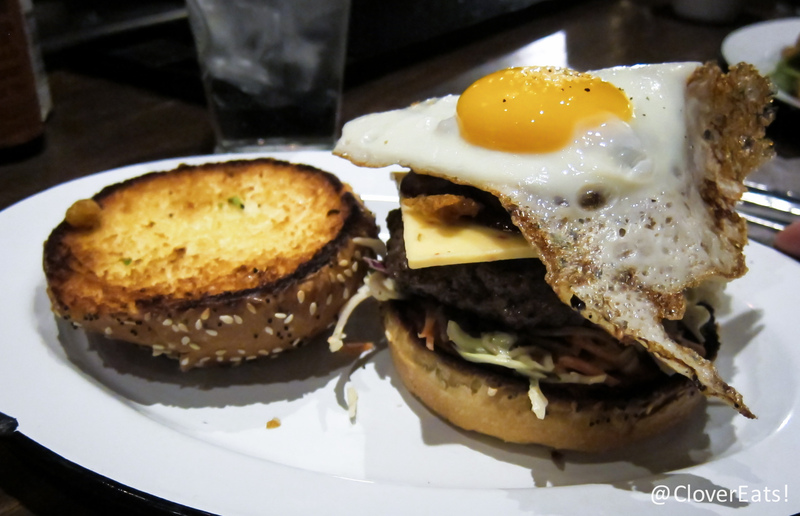 Eventually, through the combined efforts of Yelp and crowds, we ended up at Grange Hall Burger Bar. 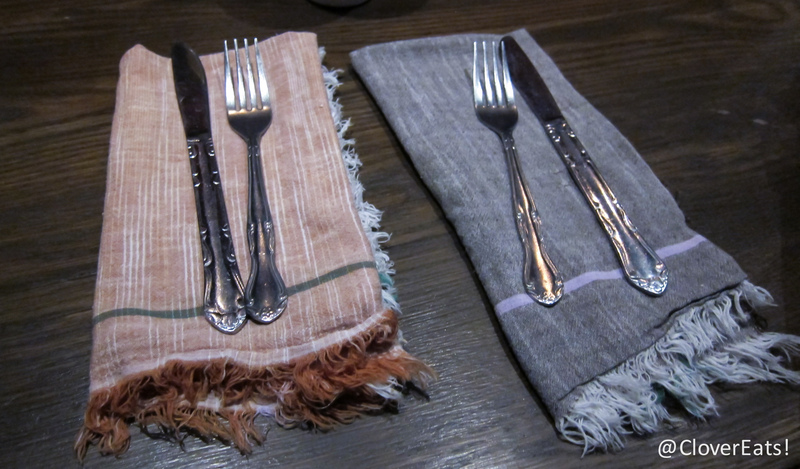 This is a very rustic, farm-to-table kind of restaurant, like a barn wedding that got turned into a restaurant. We were initially concerned about the 45 minute wait, since every single table was taken, but were able to grab some seats at the bar within 10 minutes. Hooray! I unfortunately did not bring my DSLR all the way out and had to make do with the Canon S95 pocket camera. I am always tempted to just use my phone when I go out, but I just feel like the quality of the photo isn’t the same. Having used the point-and-shoot for this meal, I am further convinced that there is no replacement for a full camera setup, especially in low-light settings. 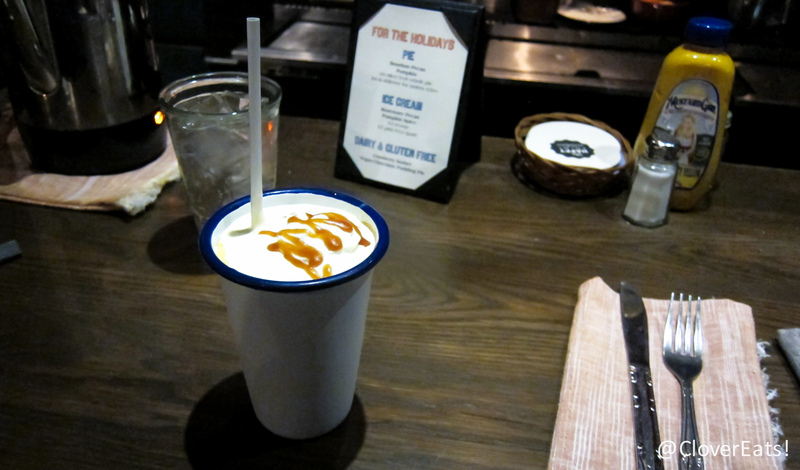 We started off the night with some delicious Bourbon Caramel Malts, which were exactly as amazing as they sound. The thick milkshake hid the alcohol well, leaving only the flavor of bourbon without its obnoxious burn. 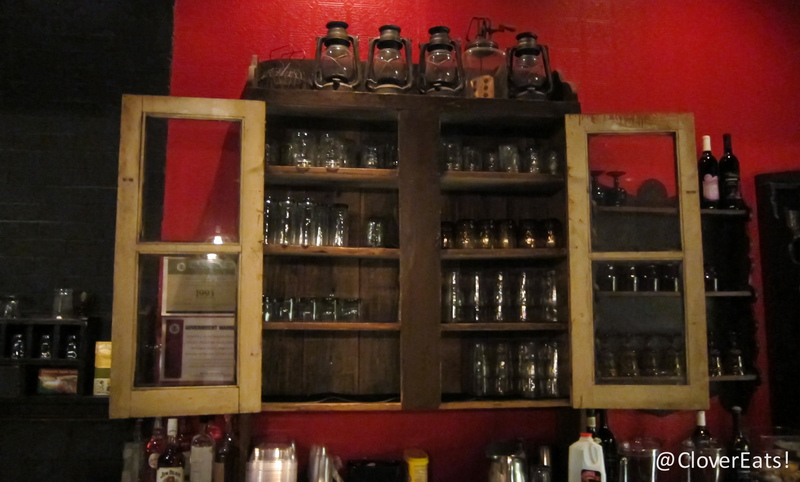 They also offered a Maple Bourbon Hot Cider, which was fantastic as well and quite warming. Fred got the BBQ Picnic burger (grassfed beef, jalapeño jicama honey slaw, chipotle BBQ, pepper jack, fried avocado), which he described as “one of the best burgers I have ever had” and “a complex assortment of tastes and textures.” I’m sure the several mile walk also helped increase the tastiness of the burger. Our friend and groomsman Shravan got the Ultimate Burger (grassfed beef, Muenster, applewood bacon, arugula, caramelized onions, horsey sauce), and reported that it was great. 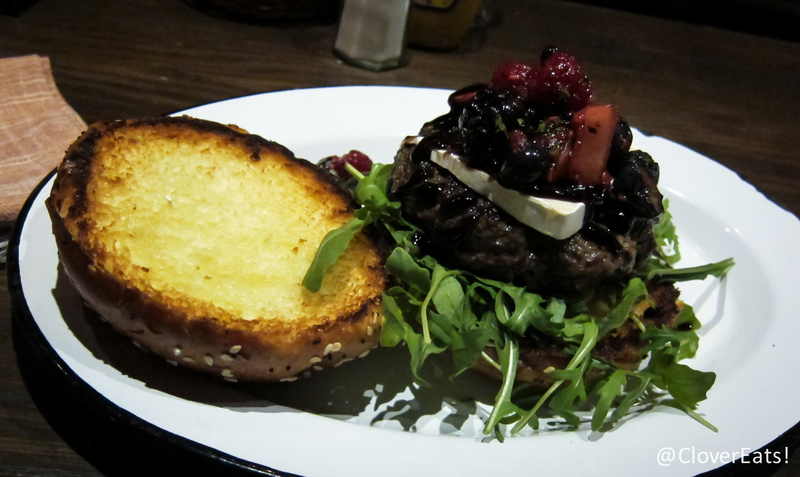 I got the Berries and Brie burger (grassfed beef, Brie, arugula, mixed berry compote, Dijon aioli, red wine balsamic reduction). I was very excited to try this, eager to see how they made brie and sweets work on a burger. Unfortunately, my instinct was correct in assuming that no, these do not harmonize. My burger was confusing, with bits of sweet, juicy berries interspersed with meaty, juicy patty – both were delicious on their own but just didn’t taste good together. I ordered my burger medium, but I think it would have been even tastier as a medium-rare. The bartender was fantastic and attentive. It took a long walk and a bit of exploring, but I think we ended up at a great restaurant. At least my Fitbit was happy with all our movement! Check them out on Yelp or at their website! Happy Thanksgiving! 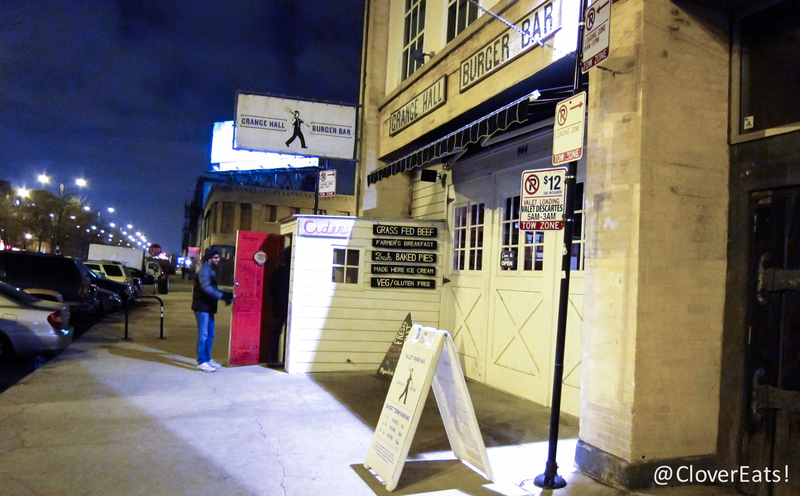 Pingback: CloverEats: bellyQ in West Loop | Clover Eats!